In this post we discuss what HBase users should know about one of the internal parts of HBase: the Memstore. Understanding underlying processes related to Memstore will help to configure HBase cluster towards better performance. Let’s take a look at the write and read paths in HBase to understand what Memstore is, where how and why it is used. When RegionServer (RS) receives write request, it directs the request to specific Region. Each Region stores set of rows. Rows data can be separated in multiple column families (CFs). Data of particular CF is stored in HStore which consists of Memstore and a set of HFiles. Memstore is kept in RS main memory, while HFiles are written to HDFS. When write request is processed, data is first written into the Memstore. Then, when certain thresholds are met (obviously, main memory is well-limited) Memstore data gets flushed into HFile. The main reason for using Memstore is the need to store data on DFS ordered by row key. As HDFS is designed for sequential reads/writes, with no file modifications allowed, HBase cannot efficiently write data to disk as it is being received: the written data will not be sorted (when the input is not sorted) which means not optimized for future retrieval. To solve this problem HBase buffers last received data in memory (in Memstore), “sorts” it before flushing, and then writes to HDFS using fast sequential writes. Note that in reality HFile is not just a simple list of sorted rows, it is much more than that. There are certain optimizations that can be done to rows/cells when they are stored in memory before writing to persistent store. E.g. when it is configured to store one version of a cell for certain CF and Memstore contains multiple updates for that cell, only most recent one can be kept and older ones can be omitted (and never written to HFile). Important thing to note is that every Memstore flush creates one HFile per CF. On the reading end things are simple: HBase first checks if requested data is in Memstore, then goes to HFiles and returns merged result to the user. There are number of configuration options for Memstore one can use to achieve better performance and avoid issues. HBase will not adjust settings for you based on usage pattern. Let’s take a closer look at these points. flushes are forced. Defaults to 35% of heap. Note that the first setting is the size per Memstore. I.e. when you define it you should take into account the number of regions served by each RS. When number of RS grows (and you configured the setting when there were few of them) Memstore flushes are likely to be triggered by the second threshold earlier. updates are blocked and flushes are forced. Defaults to 40% of heap. in a region server hits hbase.regionserver.global.memstore.lowerLimit. Blocking writes on particular RS on its own may be a big issue, but there’s more to that. Since in HBase by design one Region is served by single RS when write load is evenly distributed over the cluster (over Regions) having one such “slow” RS will make the whole cluster work slower (basically, at its speed). Hint: watch for Memstore Size and Memstore Flush Queue size. Memstore Size ideally should not reach upper Memstore limit and Memstore Flush Queue size should not constantly grow. Since we want to avoid blocking writes it may seem a good approach to flush earlier when we are far from “writes-blocking” thresholds. However, this will cause too frequent flushes which can affect read performance and bring additional load to the cluster. Every time Memstore flush happens one HFile created for each CF. Frequent flushes may create tons of HFiles. Since during reading HBase will have to look at many HFiles, the read speed can suffer. To prevent opening too many HFiles and avoid read performance deterioration there’s HFiles compaction process. 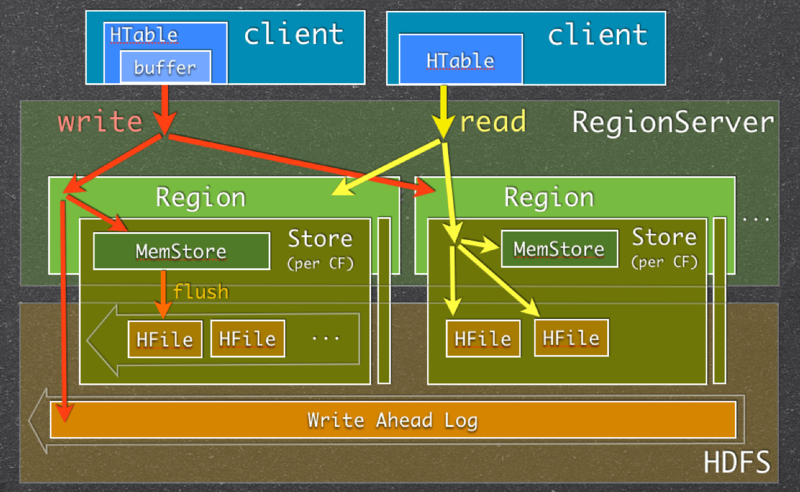 HBase will periodically (when certain configurable thresholds are met) compact multiple smaller HFiles into a big one. Obviously, the more files created by Memstore flushes, the more work (extra load) for the system. More to that: while compaction process is usually performed in parallel with serving other requests, when HBase cannot keep up with compacting HFiles (yes, there are configured thresholds for that too;)) it will block writes on RS again. As mentioned above, this is highly undesirable. Hint: watch for Compaction Queue size on RSs. In case it is constantly growing you should take actions before it will cause problems. More on HFiles creation & Compaction can be found here. “Somewhat”, because we could configure lower limit to be closer to upper, since we barely ever go over it. Memstores of all column families are flushed together (this might change). This means creating N HFiles per flush, one for each CF. Thus, uneven data amount in CF will cause too many HFiles to be created: when Memstore of one CF reaches threshold all Memstores of other CFs are flushed too. As stated above too frequent flush operations and too many HFiles may affect cluster performance. Hint: in many cases having one CF is the best schema design. On RegionServer write/read paths picture above you may also noticed a Write-ahead Log (WAL) where data is getting written by default. It contains all the edits of RegionServer which were written to Memstore but were not flushed into HFiles. As data in Memstore is not persistent we need WAL to recover from RegionServer failures. When RS crushes and data which was stored in Memstore and wasn’t flushed is lost, WAL is used to replay these recent edits. When WAL (in HBase it is called HLog) grows very big, it may take a lot of time to replay it. For that reason there are certain limits for WAL size, which when reached cause Memstore to flush. Flushing Memstores decreases WAL as we don’t need to keep in WAL edits which were written to HFiles (persistent store). This is configured by two properties: hbase.regionserver.hlog.blocksize and hbase.regionserver.maxlogs. As you probably figured out, maximum WAL size is determined by hbase.regionserver.maxlogs * hbase.regionserver.hlog.blocksize (2GB by default). When this size is reached, Memstore flushes are triggered. So, when you increase Memstore size and adjust other Memstore settings you need to adjust HLog ones as well. Otherwise WAL size limit may be hit first and you will never utilize all the resources dedicated to Memstore. Apart from that, triggering of Memstore flushes by reaching WAL limit is not the best way to trigger flushing, as it may create “storm” of flushes by trying to flush many Regions at once when written data is well distributed across Regions. Hint: keep hbase.regionserver.hlog.blocksize * hbase.regionserver.maxlogs just a bit above hbase.regionserver.global.memstore.lowerLimit * HBASE_HEAPSIZE. With HBase it is advised to compress the data stored on HDFS (i.e. HFiles). In addition to saving on space occupied by data this reduces the disk & network IO significantly. Data is compressed when it is written to HDFS, i.e. when Memstore flushes. Compression should not slow down flushing process a lot, otherwise we may hit many of the problems above, like blocking writes caused by Memstore being too big (hit upper limit) and such. Hint: when choosing compression type favor compression speed over compression ratio. SNAPPY showed to be a good choice here. can u please tell me how to improve Hbase write performance by configuring parameters such as dfs.blocksize,maxFileSize. for now to write 5 gb of hdfs log data into hbase tables Mapreduce program is taking abt 24 hrs to finisgh . so would you please help me in improving hbase write performance ? Thanks for a wonderful explanation. It does make sense to me now. We are seeing GC pauses a lot on our cluster when we do bulk import and I was thinking changing the jvm settings to add +NewParGC and CMSInitiatingOccupancy threshold. If it doesn’t fix, I was planning to implement a work around for heap fragmentation as explained in Hbase Jira in the link below. But your explanation makes me also to think in a new direction. I concur with your explanation and adding to that, I think more flushes cause more smaller Hfiles for a lot of regions on a Region Server. This makes the Compaction threshold to be reached very fast for every few files of a region and increase the overhead on memory doing compaction frequently. Any thoughts on this? Yes, having a lot of HFiles will trigger more compactions which are at least IO heavy. You should avoid this when you can. You might also want to play with compaction thresholds here (e.g. hbase.hstore.compactionThreshold). I’d also suggest to look at (if you haven’t) Bulk Load functionality: http://hbase.apache.org/book/arch.bulk.load.html, if that is applicable in your case. Can you explain how you came to a conclusion for this statement? “When number of RS grows (and you configured the setting when there were few of them) Memstore flushes are likely to be triggered by the second threshold earlier.”. It is explained in the below snip from your post. @Guru – get SPM for HBase and share your graphs, maybe somebody on the HBase mailing list or here can help. I have never used SPM before and was looking on SemaText’s website and it says SPM is still completely free of charge. I will run it on my personal cluster first and see how it is. * You have max heap in RS set to 10GB. 1. You start with 10 Regions. In this case memstores will be flushed mainly because of the hbase.hregion.memstore.flush.size threshold, as *normally* (flushes are fast, etc.) you will never reach second threashold (max size occupied by 10 regions in this case is 3GB which is 30% of heap). 2. Number of regions grows to 100. In this case even 20 Regions with more or less “full” memstore (up to 300Mb, so 6GB total, which is 60% of heap) will cause RS to reach second threshold. More importantly, in this case it will reach hbase.regionserver.global.memstore.upperLimit, which will cause updates blocking. With that said, when you configure hbase.hregion.memstore.flush.size think about how many regions there will be. And try to keep regions count per RS more or less constant. Otherwise, adjust this param as number of regions per RS grow. Hey Alex, Thanks for a really nice post.